Information: This cast concrete-and-mosaic landscape design project lends a contemplative sense of place to a newly-created two-block pedestrian mall. On the west side of the mall, the artists installed understated glass-mosaic squares in traditional brick and stone entry gates. 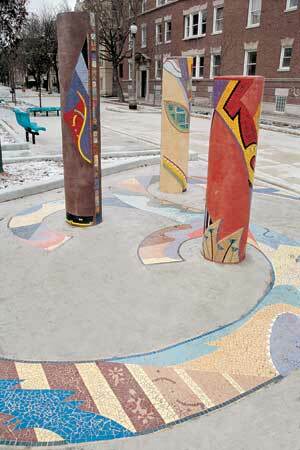 On the east side, a cracked ceramic tile pavement winds among three columns covered in glass and handmade ceramic tile. The mosaics were created with a team of Gallery 37 youths whose makeup reflected the vibrant diversity of Uptown.